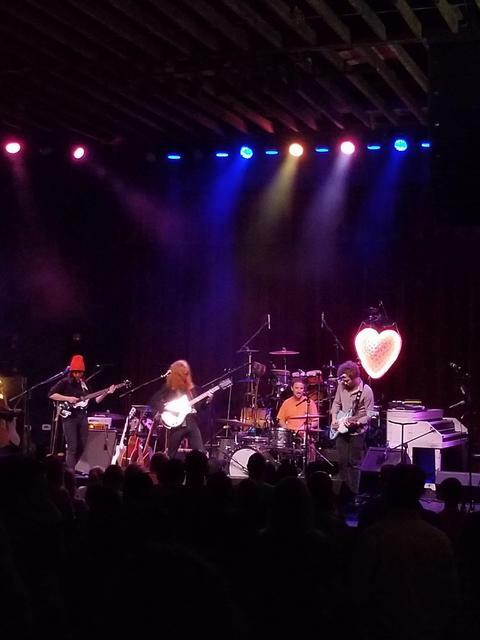 Guster – The Look Alive Tour Jams Out in Charlotte Reviewed by Stephanie Cunningham on April 12, 2019 . Guster’s newest album, Look Alive, debuted at number five on the Billboard 200 Chart this past February. As I looked around the Neighborhood Theatre on Tuesday night, I could see how a band who’s been around since 1991 was able to pull this off- an enthusiastic and dedicated fan base. All around were people in Guster tees; some new tees right off the merch table, but also some very old ones with holes and faded lettering. One gentleman next to me was hopping up and down on his toes excitedly, discussing which songs he hoped they’d play and which ones he was sure they would play. I just kept thinking how mad I was that they are from my hometown of Boston and I have never seen them live. Before I got to see what I’d been missing out on for so long, Saintseneca opened the show. The folk-punk band from Columbus, OH had a great sound- nice harmonies and clear vocals. Their lead singer, Zac Little, has a huge mane of red hair and a big matching beard which was fun to watch while they rocked out. I really enjoyed when their guitarist/bassist, Caeleigh Featherstone sang. She had a fairy-like voice, much like her fairy-like name, and really added some depth to their songs. Little mentioned that it was the band’s first time in Charlotte and I have a feeling they will be back. About 40 minutes later, and much discussion on how much weed the band was smoking backstage, Guster came out. From there on the audience was in for an amazing night because the band’s show was a total blast. The Neighborhood Theatre is designed with a slanted floor, like stadium seating, so that the back of the club is higher than the stage. Shorties like me can actually see the band and not just the backs of other concert-goers. I could see the big rack of guitars and basses on the side of the stage and I’m pretty sure each guitar-playing member used at least four different instruments. It became a game for me to guess which guitar they would use for each song. I’m sure seasoned Guster fans will agree, but I was absolutely blown away by the drummer. Brian Rosenworcel is the original drummer and he is amazing. Not only did he have two different kits- one with bongos and funky cymbals and another smaller, standard kit- but he played almost entirely with his hands for most of the show, even the cymbals. He’s a tall, lanky guy and looked, at times, insane while banging on the drums. During “Airplane Song,” which was a big hit with the audience, his drumming became louder and louder until a final crescendo making the audience go absolutely nuts. The other band members were crazy too, switching not only between guitars but between instruments. Both singers played guitar and bass, and they also played the piano, trumpet and some kind of xylophone. Luke Reynolds, Guster’s newest member, switched between piano, bass, and the banjo. They clearly take their new album title seriously because no one was slacking on stage. Ryan Miller, the lead singer, is a true performer. He had great stage presence and kept the audience on its toes with jokes and antics on stage. During “Doin’ It By Myself” he jumped off the stage with his microphone and proceeded to walk through the crowd while singing. Everyone was so excited and helped hold the microphone cord up for him. At one point, between lyrics, Miller said he “should get a wireless microphone.” He could, but it wouldn’t have been as fun to watch as seeing him pulling the cord all around the venue. When he was back on stage he said, “See, the singer from Panic at the Disco couldn’t do that. He’d get murdered.” He was clearly making fun of himself for not being as famous and probably for having an older, less murderous audience. My favorite part of the night was when Miller pulled out his phone to read two emails to the audience. The first email was from a Charlotte resident named Will who was asking to play the harmonica on stage during one of the songs. “Come on stage Will!” And he did. Then Miller read a second email from Spencer, also a Charlotte resident, also asking to play the harmonica on stage. “Come on up Spencer!” And he did. How funny that two guys would email to play harmonica at the same show and how cool that Guster brought them up to perform the song “Backyard?” Well, the two guys were awesome and had the crowd whooping and hollering. Miller joked at the end that the band thought it would be “really anticlimactic, but it wasn’t!” No, it was great.